This is, as named, my everyday bread recipe, lifted from Jack Monroe, the Bootstrap Cook. It is the most forgiving and adaptable of recipes; you can use pretty much any mix of flour, you can bake it into any shape you like, including rolls, you can add nuts or seeds, and it scales beautifully. Now I’ve got my Kitchenaid back, I just set a batch going while I’m cooking something else, prove it overnight, and bake it in the morning. Mix the dry ingredients well together, then add the water. If you’re using a stand food mixer, you can walk away for five minutes or so at this point, otherwise you’re going to have to knead it. I added some dill weed to this morning’s loaf. When kneaded, form it into a ball and put it in a bowl covered with clingfilm. Even in my cold kitchen, it was well risen before I went to bed. Before baking, knock it back (just a bit more kneading), and then shape it into whatever you want – I did a round loaf this morning. Leave it for about 15 minutes. Heat the oven to about 190C (I think that’s gas mark 5), and bake for about 40 minutes. 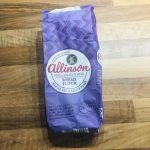 I’m using the Allisons bread because the Shonky Shop* (as we call it) at the top of the road is selling this off at 3x1kg bags for a quid. We have about 10kgs of it in the store cupboard, and I’ll be going to buy a load more this week, if they’ve still got it – it’ll be good for a few months yet, and Brexit is coming. *They sell food coming up to “sell by” date, and we’ve had some cracking bargains from there.